Harnessing Scotland’s unique natural resources, Caorunn is made of the highest quality triple-distilled pure grain spirit, crystal clear Scottish water, six traditional and five unique, locally foraged Celtic botanicals from the surrounding hills. Caorunn is infused to perfection in the world’s only working Copper Berry Chamber. 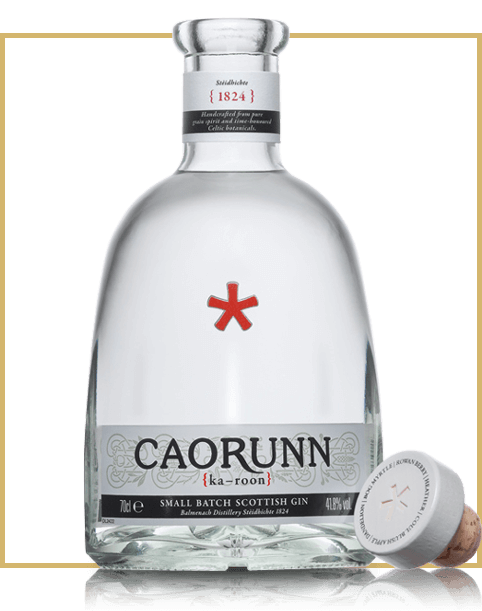 Caorunn is an aromatic taste adventure with a long dry finish, its delicate fruit, floral notes evoke the charm of the Scottish Highlands, and its cocktails engage the most discerning palate with nuanced, sophisticated notes. Caorunn G&T is uniquely served with a freshly cut red apple to enhance its invigorating, dry and crisp taste. Caorunn is the taste of wild sophistication – an expert infusion of five locally foraged with six traditional botanicals. Beautifully versatile, Caorunn is perfect in any classic or contemporary cocktail. Color Perfectly clear like pure Scottish water. Nose Fresh, floral, citrus, slightly spicy and aromatic. Palate Clean, crisp, sweet, full bodied and aromoatic. Finish Invigorating, long lasting, refreshing, crisp and slightly drying.